The iPhone SE is a very popular and unique device among Apple fans. Despite not featuring the latest and greatest technology, the iPhone SE appeals to a group of people who want a good smartphone in a smaller form factor. Apple decided to cater to a market of people who preferred the smaller form factor of the iPhone 5. Essentially, Apple took the internal components of an iPhone 6S and put them into the body of an iPhone 5. This smaller device has proven to be very popular. In fact, the iPhone SE enjoys 5.1 percent of the entire smartphone market share in the United States. That’s pretty impressive for a device that does not offer bleeding edge features and components. You will never hear the iPhone SE brought up in conversation along the likes of the iPhone X, Samsung Galaxy S9, or Google Pixel 2 XL. One of the only things the iPhone SE has in common with other smartphones is its need for protection. One drop could spell disaster for the glass display or glass camera lens. While the iPhone SE doesn’t carry a hefty price tag like the $1000 iPhone X, it still costs a few hundred dollars to buy one. That’s not exactly a low enough price to consider the iPhone SE a throwaway phone that doesn’t need protection. Luckily, there are a number of great iPhone SE cases on the market for those who want to give their device some extra protection against drops, bumps, and spills. Before we jump into the list, let’s discuss methodology. After all, if you don’t know why a case is great then why would you want to go out and buy one? First, we will look at the protection factor. We want cases on this list that actually provide some protection against the bumps and drops an iPhone SE might encounter throughout the day. Next, we will take style and fashion into consideration. A smartphone is an accessory that you carry with you all day long. While protection is the most important factor in a case, it doesn’t hurt if the case looks good too. Finally, price will come into consideration. We want to find the cases with the most protection and style per dollar. That doesn’t mean this list will be made up of cheap, off-brand cases. However, for cases with a higher price tag, we want to see that price tag justified with quality and style. 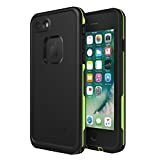 If you are in a line of work that requires a little extra protection for your device or you simply don’t have the best reflexes for catching a falling phone, then you may want to consider the Spigen Tough Armor case. This case offers military grade shock protection for the iPhone SE. Spigen has constructed their case with two distinct layers to protect your device. First, there is a soft TPU material that wraps around the entire back side of the device. Then a hard layer of plastic fits over much of the soft first layer to provide complete protection. The appearance of this case is very nice. When you hear a name like “Tough Armor” you expect to see something decked out in camo that’s the size of an early 90’s boom box. In fact, the Spigen Tough Armor case is relatively thin for the level of protection it offers and users should have no problem easily sliding their device in and out of their pocket. As far as pricing goes, we would rank Spigen Tough Armor in the mid-range of prices when compared with the competition. This is not the cheapest case you can find on the market but the price is very reasonable for the level of protection offered. Spigen proves with their Tough Armor case that you don’t have to spend to the limits of your budget to get a quality case. 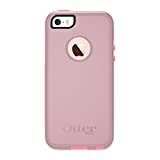 Otterbox is one of the brands of smartphone protection that has been around since smartphones really became popular. There was a time when an Otterbox case was one of the only well-known case brands on the market. Of course, things have changed and there is a lot more competition in the smartphone case industry these days. Still, Otterbox is a very well respected and trusted brand name that we feel confident in recommending. The Commuter Series is not Otterbox’s most protective iPhone SE case but we still believe it belongs in the conversation among the best iPhone SE cases. The build of the Commuter Series case is very good with additional attention to detail including port covers that protect sensitive ports from dirt, dust, and debris. If you work in a shop environment or outdoors, then this case will definitely help prolong the life of your iPhone SE. In addition, the Commuter Series case includes a screen protector to help prevent scratches on the display. Best of all, the case is very well-designed and looks like a stylish case you can feel comfortable carrying around or sliding in and out of your pocket. You could go from the construction site to the restaurant without feeling like your phone looks out of place. Pricing for the Otterbox Commuter Series is a little higher than some of the competition but we feel the Otterbox name and extra small features like port covers make this case well worth the cost. Another very well-known name in the smartphone case industry is LifeProof. Their heavy duty cases are trusted by users who demand the most from the case they put around their phone. The biggest selling point of the LifeProof FRE Series case is the IP-68 rating which means that the case provides one hour of waterproof protection for a phone that has been fully submerged. This is, of course, assuming that all ports have been closed off from the outside world. In addition to excellent waterproofing, this LifeProof case also offers drop protection from heights up to 6.6 feet and an invisible screen protector that prevents scratches. Despite all of this heavy duty protection, the LifeProof FRE Series case is very slim and lightweight. You can count on waterproofing, drop protection, and scratch protection without feeling like you are carrying around a bulky, heavy device. The one downside to choosing this case is the price. The incredible features come at a cost and you should expect to pay more than twice as much for a LifeProof case when compared with others. Of course, value is dependent on your own personal needs. 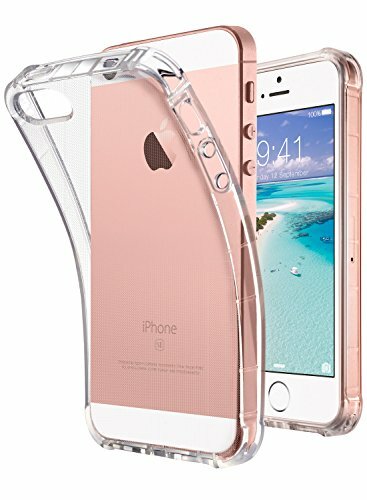 Someone who is rough on their phone will definitely benefit a lot from the additional protection of a LifeProof FRE Series case for their iPhone SE. If you don’t quite need the protection of a LifeProof case but you would like to be able to count on your case for small drops or bumps then Caseology has a number of solutions. The one we think checks off a lot of boxes is the Caseology Savoy Series case. This thin case provides protection for the sides and rear of the device. Most importantly, to some people, the case adds a lot of style that the more heavy duty LifeProof and Otterbox cases do not. The Caseology Savoy Series case slides together as two pieces to create a secure, snug fit around your iPhone SE. There is no need to worry about the case sliding off or coming loose when you need to count on it most. Style is, of course, a subjective thing. The Caseology Savoy Series case comes in a number of different colors with a gold accent piece. To some, the gold will look sleek and stylish. Others may find it to be gaudy or distracting. We do appreciate that this case is trying to look different than many of the other cases on the market for the iPhone SE. With regards to pricing, the Caseology Savoy Series case falls in line with other mid range cases like the Spigen Tough Armor mentioned above. There are less expensive cases with a simpler look available and there are more expensive cases with more protection features on the market as well. Other than damaging your smartphone, running out of battery is the most annoying thing that can happen. The Mophie Juice Pack Helium has you covered for both damage protection and battery life protection. This sleek case doesn’t add a lot of bulk to your iPhone SE but offers a 1500mAh external battery that can charge your iPhone SE when the battery icon is beginning to run dangerously low. That essentially doubles the battery life of your iPhone! The fit and finish of this case is among the nicest on this list of best iPhone SE cases. The soft touch feel allows users to maintain a secure grip and, despite a 1500mAh battery being built into the case, the fit is very sleek and appealing. It’s rare to see a case offer so much function and so much style at the same time. This is definitely a case you want to consider if you are the type who always finds they are running out of battery at the most inopportune times. Mophie is a very trusted brand when it comes to external batteries so you can feel confident choosing a product from them over some of the other options available on the market. You essentially get protection and an external battery built into one package with the Mophie Juice Pack Helium so there is a lot to love about this case. With that said, there are some downsides to choosing this case. The most obvious downside is the price and it should come as no surprise that a case with a built in external battery is more costly than other options on the market. In addition, there is less protection offered by this case than some of the most heavy duty cases on this list. 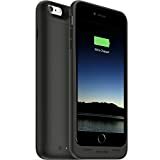 If you want added battery life on-the-go but you also need the best protection possible then you may want to consider buying a LifeProof case and an external battery pack that you can plug in to. It’s not the most elegant solution but it may be the alternative to the less protective Mophie case. The great part about building this list is that we were able to include brands that are commonly found at many online retailers as well as brick and mortar stores. This gives you a great opportunity to spend some time shopping around to find the best deal. If you are considering any one of the best iPhone SE cases listed above, then you will surely be happy with your purchase. All of the options have their own strengths and weaknesses. Just consider your own unique needs and purchase based on what you will get the most benefit out of.